One of the world’s oldest stories comes to life from the point of view of a single poet in “An Iliad,” directed by Penny Metropulos (“Red,” “Picasso at the Lapin Agile,” “Up”) at Syracuse Stage. Lisa Peterson and Denis O’Hare’s adaptation of Homer’s epic poem expresses the suffering and heroism of war, connecting the decade-long battle to the woes of war and conflict that continue today. The emotionally passionate and yet humorous poet, played by Joseph Graves (“Red”), embodies many characters, from the warrior Achilles to the seductive Helen of Troy. Presented by Syracuse Stage, “An Iliad” runs May 15-June 9 in the Arthur Storch Theatre at the Syracuse Stage/SU Drama Theatre Complex, 820 E. Genesee St. Tickets are available in person at the Syracuse Stage Box Office, by phone at 315-443-3275 and online at www.SyracuseStage.org. “An Iliad” is sponsored by the Syracuse Stage Board of Trustees. Media sponsors are the Syracuse New Times and WRVO. Syracuse Stage season sponsors are the Post-Standard and Time Warner Cable. “An Iliad” will be performed in the flexible 200-280 seat Arthur Storch Theatre with an “avenue” seating configuration. Two banks of seating will flank opposite sides of the performance space, creating an up-close experience that will feel like performance in the round. Avenue seating was previously utilized for “Lookingglass Alice” in 2010. Illuminating the heroism and horrors of war, “An Iliad” is a contemporary adaptation told in today’s vernacular, a 100-minute turbulent adventure asking the question: What has really changed since the Trojan War? 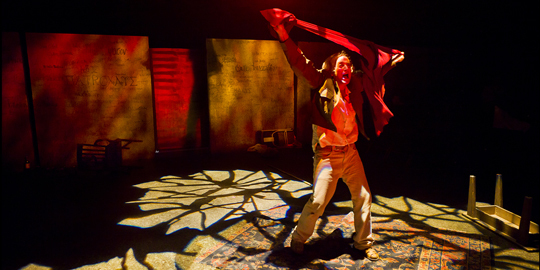 Throughout the show, the poet makes multiple comparisons to contemporary society and invites the audience to imagine just how traumatic this ancient battle was. His interruptions of the story give insight on how massive the war was, the scale of how many people it affected and how violence continues to cause suffering today. The poet invites the audience into the story with him, drawing parallels to the way people viewed war and honor, now and then. A passionate man with a disheveled appearance, the poet admits that he has been singing this story for years. His account of the Trojan War starts with the arrival of the hundreds and hundreds of ships into the city of Troy and centers around the great warrior Achilles, his enemy Agamemnon and best friend Patroclus. The role of the poet will be performed by Joseph Graves, who Syracuse audiences will remember from his performance as abstract expressionist painter Mark Rothko in last season’s production of “Red.” Graves is the artistic director of Peking University’s Institute of World Theatre and Film in Beijing, where he has directed and/or produced 70 plays. Graves and Metropulos collaborated previously on a critically acclaimed production of “An Iliad” for Portland Center Stage in 2010. “A performance that can honestly be described as spellbinding,” said Willamette Week. “Intimate, unstuffy, timely, accessible,” said the Seattle Times. Co-Playwright Lisa Peterson has directed the New York productions of “Shipwrecked, The Model Apartment” (Primary Stages); “End Days (EST)”; “The Fourth Sister, The Batting Cage” (Vineyard); “Birdy, Chemistry of Change”(WPP/Playwrights Horizons); “Collected Stories” (MTC); and “Sueno” (MCC).